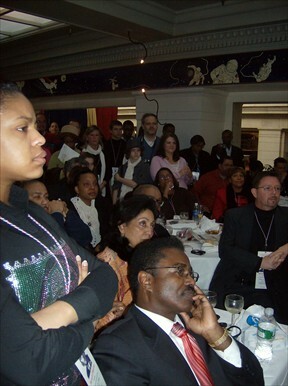 The coup de grace was the Woman’s National Democratic Club Inaugural Ball. Debra Tidwell rose to unprecedented heights and I must say, of all the 8 million times we’ve performed together, this was the best. 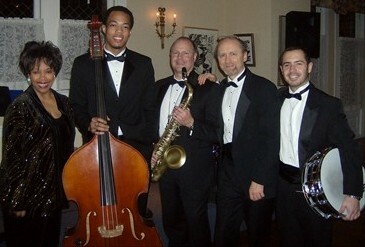 The band was ready to play, and the 270 guests at WNDC were ready to dance and have a good time. Eric Wheeler, the workingest man in Washington, DC, laid down a solid bass all night long, not to mention the entire Inaugural festivities. 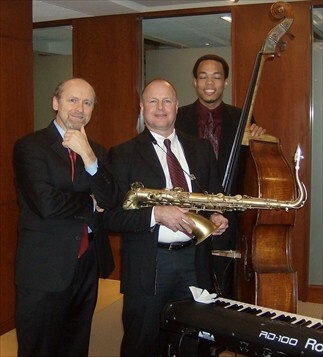 Greg Twombley blew that tenor sax and Danny Villanueva played drums.Thanks to Rosemary Monagan for making this happen. After the ‘hottest ticket’ party, it was off to the home of one of my colleagues where I slept for about two hours. 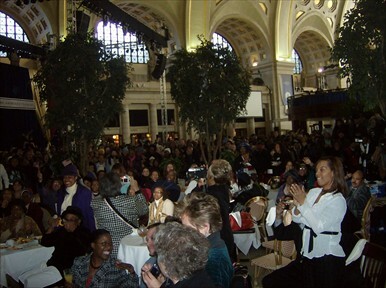 We were 16 blocks from Union Station, where we performed at 10:00 a.m. on Jan. 20. This was a group of Maritime unions, Seafarers, various pipefitters, Firefighters, and other hardy souls. It was a very emotional crowd, and we felt like we were in the thick of it, albeit a half-mile from ground zero. We were blessed with a performance by Beau Williams of Houston, who sang the Star Spangled Banner to kick things off. 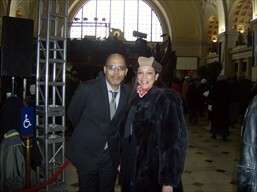 I have included several photos of my colleagues and the guests at Union Station. These photos were taken around the time of the actual ceremony at noon. Thanks to Shera Thompson (see photo) for putting us all together. 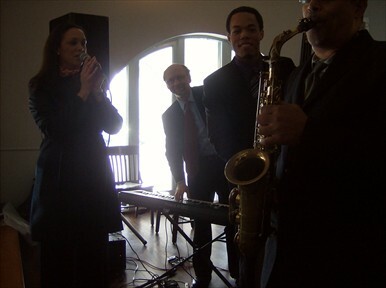 The band: Julie Hall, Eric Wheeler and the legendary Marshall Keys. 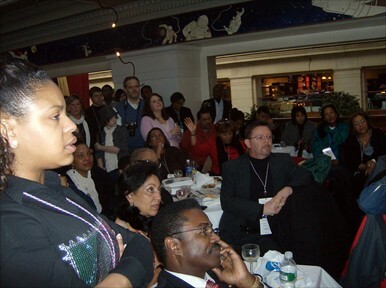 The Inaugural on Jan 20 was a 5 day drama, ordeal, celebration, depending on what your role was. If you were a military musician, it was an 18 hour day, most of it in 25 deg F with a stiff 15 mph wind in your face. A couple of members of the New Columbia Orchestra were actually on the reviewing stand. They offered the first report that Yo-yo Ma, Itzhak Perlman and Anthony McGill were lip-sync’ing, a fact that created quite a stir in the press. But they had no choice, since the weather would have destroyed their instrument in about 2 minutes. For me, the work began on Friday, Jan 16, when I did the initial load-in for the a couple of our events. 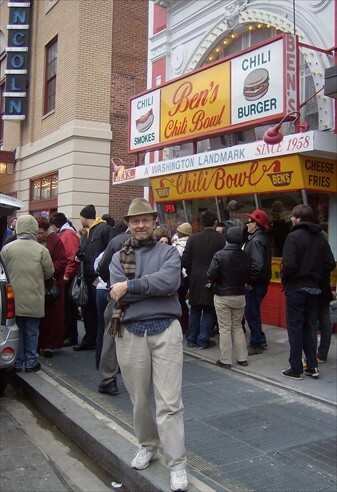 The load-in was completed Sunday and included a stop for a photo shoot at Ben’s Chili Bowl. You couldn’t get into the place because of the mob, but the mood was enthusiastic. 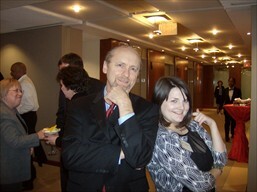 Our first event was on Jan 19 at the office of what may safely be described as a prominent Chicago law firm. The guests included Senator Durbin, numerous city mayors, and the about-to-become-governor Quinn, who was even then patiently awaiting the disintegration of Rod Blagojevich. It was Greg Twombley and Eric Wheeler for this one, and it was a good prelude for things to come. That evening we were at the Fairfax Hotel for what was billed as the hottest ticket in town. 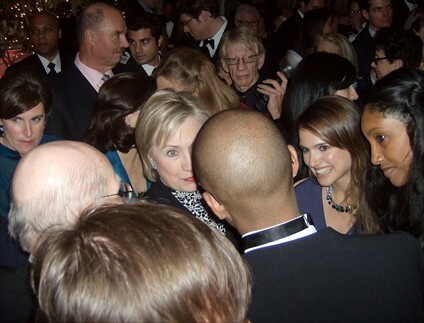 Bill & Hillary Clinton were there for most of the evening, as were Jessica Beal (why didn’t I get a photo of her? ), Natalie Portman (in the photo with Hillary), Charlie Rose, both Woodward and Bernstein, Henry Kissinger, Tom Brokaw, etc. etc. The personnel were Pete Barenbregge, Rick Lillard, Ken Rittenhouse, Eric Wheeler and Phil Matthieu. 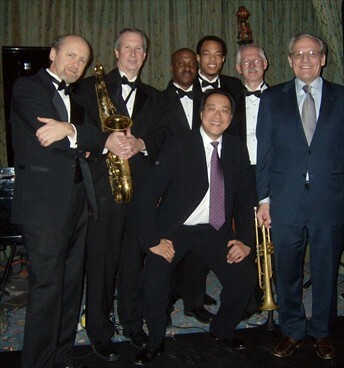 All but Phil are in the photo which shows Yo-Yo Ma doing the limbo while Bob Woodward holds the trumpet. 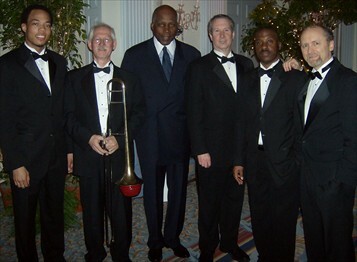 Photo: Vernon Jordan with the band.